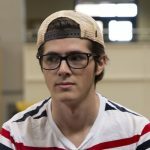 Today we speak with Nick Testa, a sophomore chemical engineering major from Hainesport, Burlington County, who lives on campus in Whitney Center. 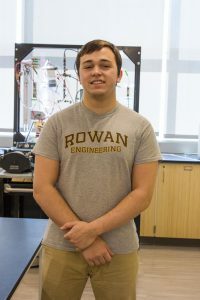 Nick will share his #PROFspective with us on what it’s like to be a Rowan University student and how he’s getting the most out of his college experience as a Rowan Prof.
Social clubs: Phi Kappa Sigma fraternity (Skulls): academic chair, second vice president; Unified Sports: Coach, Freshman Leadership Involvement Program: mentor, and Student Alumni Association. I chose my major because I am interested in spending my life producing or monitoring the production of energy to provide for society’s energy demands while still protecting the environment. One reason why you chose Rowan? 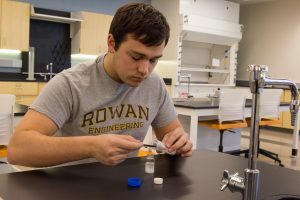 I chose Rowan because it is a good engineering state school where I could get a good education while still being within an hour from my home. 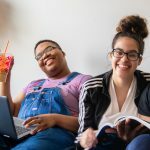 Rowan also offered me a generous scholarship to come to school here, so I am putting in my best effort to make the most of my college experience and get involved as much as possible while maintaining a good GPA. A typical Thursday in my life involves me waking up at 9:00 a.m. to work on homework or study for any quiz or test I usually have that day or the next. After two hours of studying, I walk over to the Office of Student Activities for my weekly 11:00 a.m. Rowan After Hours (RAH) Tech Committee meetings in which the tech group prepares for the weekend’s upcoming Rowan After Hours events. Since I was promoted to be the Technical Services Coordinator for next year, these meetings are important for me to continue to further my knowledge of the tech equipment and what different RAH events need in terms of tech set-up. After about an hour spent in these meeting, I have ti me to grab Sono or Jersey Mike’s in the Student Center before I have to walk over to Robinson for my 12:30 p.m. math for engineering analysis class, where we are learning linear algebra and applications of differential equations. 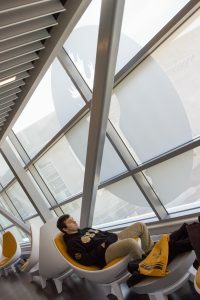 After class gets out, I usually head to the Campbell Library or the engineering building, Rowan Hall, to do homework for an hour before my next class. At 3:30 p.m., I head over for a double block of my chemical engineering fluid mechanics class which covers movement of different fluids in various circumstances and conditions. When I get out at 6:15 p.m., I immediately get a quick dinner at some food outlet in the Student Center before I go to my fraternity’s e-board meetings. There I serve as the second vice president and academic chair. If there isn’t an e-board meeting, I usually have some other obligation from one of my other six clubs, for example the Student Alumni Association had a “Mocktail and Mingle” event which I attended as a member to meet and talk to successful Rowan alumni about their transition into life after college. At 7:30 p.m. on most Thursdays I report to the Office of Student Activities for my job at Rowan After Hours. For the past year, Rowan After Hours has been an extremely enjoyable job every weekend for me and the rest of the staff to put on live entertainment and various events for Rowan Students, so coming to work is usually a great end to my day! When RAH is over at 1 a.m., the staff cleans up all the equipment and gets out at 1:30 a.m. I then end my night by walking back to my room in the Whitney Center, doing any extra homework or studying, and finally go to bed around 3 a.m. 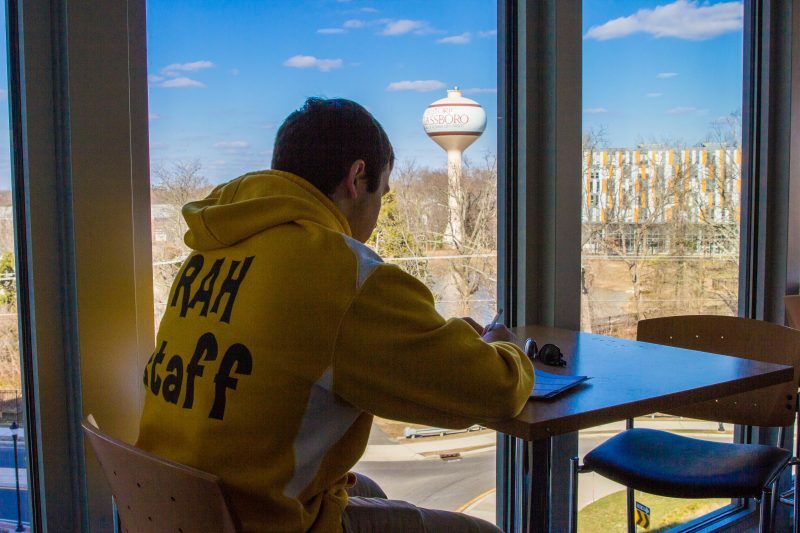 While my average day is crammed full with classes, homework, studying, clubs, a fraternity, and work, I do love being a Rowan student and I try to further my college experience a little more every day!